Learn more about the high-quality and durable gun belts being introduced from Bigfoot Gun Belts. Bigfoot Gun Belts is proud to introduce the product lineup for their Untamed Series of leather gun belts. Featuring three different models of belt that are all available in either brown or black, the Untamed Series is meant to put high-quality and dependable gun belts in the hands of serious firearm enthusiasts. Here is a closer look at the different models of belt in the Untamed Series. This belt is the most legendary and premium belt produced by Bigfoot Gun Belts in their Untamed Series. Constructed with an intense attention to detail, the Untamed double-layer 18 ounce leather gun belt is built with a dual layer of heavy duty and extra thick English bridle leather. The thickness of the premium leather combined with the core of stainless spring steel sandwiched between the layers makes this belt perfect for anyone who intends to carry a full-size handgun. This belt will not sag or twist due to the weight of a heavy pistol even after extended use. For those who plan to carry a smaller pistol or a lighter polymer pistol, the Untamed double-layer 14 ounce leather gun belt is a wonderful option. Made with a lighter grade of leather perfect for supporting more compact and light pistols, this belt still features the stainless spring steel core to ensure the rigidity and security of your firearm. 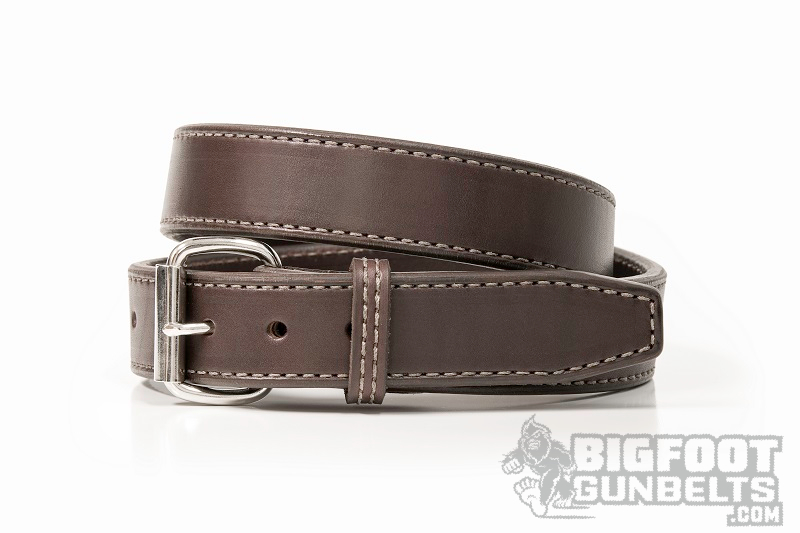 Available in both traditional black and a rich brown color, the double-layer 14 ounce belt is a slight step down from the 18 ounce version, but nothing is lost in the attention to detail and quality craftsmanship that Bigfoot Gun Belts prides themselves on. If a spring steel core in a gun belt is not something that you prefer or something that you need, Bigfoot Gun Belts has you covered. The double-layer 14 ounce gun belt is made with the same premium materials as the rest of the Untamed series of belts, but is designed with sub-compact and compact pistols in mind. Pistols of that weight do not need the extra support of the stainless spring steel core. This leather gun belt will provide both comfort and support for smaller handguns and even perform admirably when you aren’t carrying. Bigfoot Gun Belts are 100% American made and come with two guarantees of their quality. 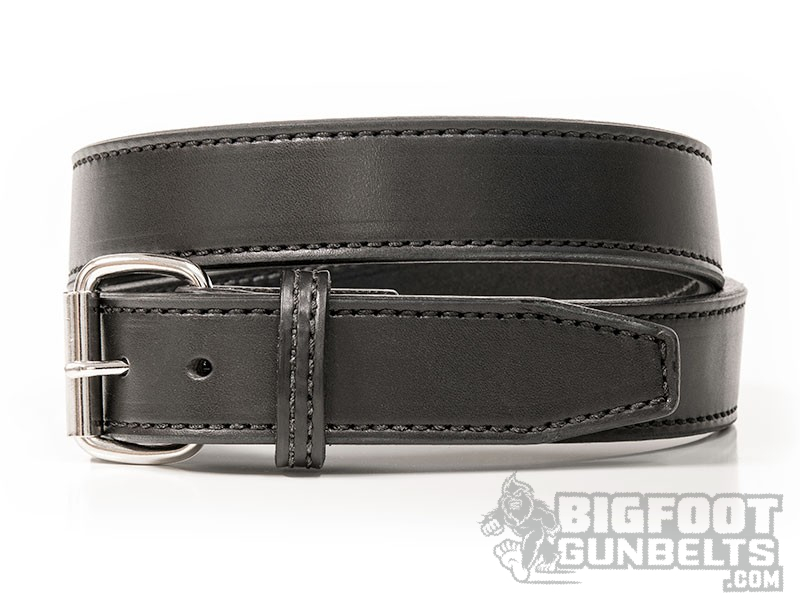 If you are unhappy with your new leather gun belt within seven days of purchase, Bigfoot Gun Belts will happily offer a full refund or an exchange for another product. The Idaho-based company also offers a Legendary Gun Belt Warranty on all of their belts which guarantees the materials used for one year after purchase.